The race to host UEFA’s European Championships in 2020 has been thrown wide open with the Turkish Football Federation (TFF) having elected to withdraw its bid in favour of concentrating its efforts on landing the 2024 edition. The TFF had initially put forward Istanbul as a candidate city for EURO 2020 – which will be held in multiple cities across Europe to mark the tournament’s 60th anniversary – however, it has now confirmed it will instead seek to host the entire competition, rather than share it with other cities. 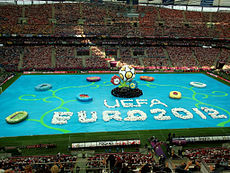 Last Friday marked the deadline for submission of final bid dossiers for EURO 2020. European football’s governing body, UEFA, announced in September that 32 of its member associations met the deadline to state their interest in hosting the games, which will be staged in thirteen cities across the continent. The matches will be split into thirteen different packages, with twelve standard packages, including three group matches and one knockout round (round 16 or quarter-final), and one package for the semi-finals and the final. The TFF had made an official application to UEFA to host the semi-finals and final of EURO 2020 at İstanbul’s Atatürk Olympic Stadium. Istanbul lost out in its bid to host the 2020 Olympic Games in September – a development that saw it labelled a strong favourite to land the showpiece package of UEFA’s novel concept for its leading national team competition. UEFA President, Michel Platini, has previously stated that Turkey would be his “preferred choice” to land the semi-finals and final of the competition. UEFA’s Executive Committee will announce the appointment of EURO 2020’s thirteen host cities on September 25, 2014.